Description: Ideal species for anyone who wants a crocodilian. 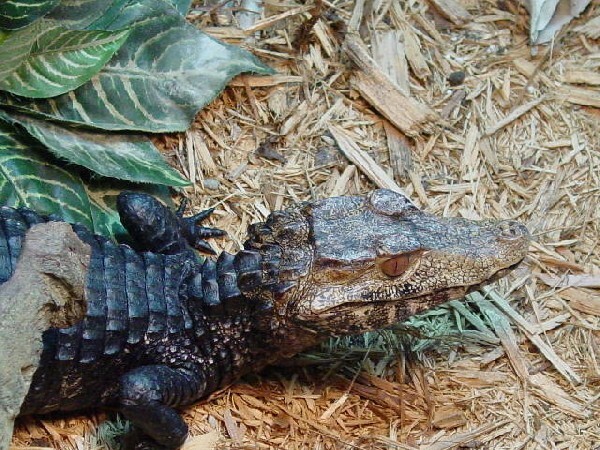 Dwarf Caiman are much easier to house and care for, than larger crocodilians. I have been a reptile hobbyist, breeding and rescuing, for about 27 yrs. I have worked in the Pet Industry for 20 yrs. They are not really mean, as much as demanding of respect. Too many people get alligators because of some passionate idea of keeping them like puppy dogs. These are top predators, in their native habitat, and grow way too large for most people to manage in their homes. I receive rescue gators every year, from misinformed owners, who were told that gators will not outgrow their enclosures. Any crocodilian can be trained to a feeding call. By doing this, they do not always expect food when you enter their enclosure. Dwarf Caiman, typically, do not like being held, but they are not vicious either. When properly trained, they will mind their own business and you can easily maintain their enclosure without incident. I simply feel that a 4-5' caiman is much more managable for the average keeper than a 10-12' Gator. If one can supply a larger crocodilian with a permanent home and proper space and care, then I do not have a problem, but I think that all of us have seen many crocodilians kept in way too small of enclosures and fed inadequate diets. They deserve better. Don't they? p.s. is that your caiman? no offense but their also mean as hell and they made it almost illigal to move them out of florida...believe me i tried getting one, the only possible way ur going to get one is off a private dealer on the net thats gunna charge more than most people are gunna spend on one, beutifull crocodilian though. Sorry, if I got "preachy". I think that it is an unfortunate side-effect of handling rescue animals. Sometimes we see the same species being mistreated over and over (ie: alligators, burmese pythons, green iguanas, etc...). It's hard to not get frustrated. Yes the caiman was mine. I had raised him from a hatchling. He died last year, from a toxic reaction. He kept going into seizures. The vet initially thought that it might have been a brain tumor or something putting pressure in his cranium. I later found out that the pet store I purchased the feeder mice from, treated the mice with a flea powder to get rid of mites. I usually bought frozen mice and chicks. It was a fluke, that the only time I bought live rodents this happened. They had been out of frozen. its no problem at all, i used to get very preachy myself when i was into saltwater aquaria, you would see people posting pictures of their sharks and rays in very small containments, such as a 5' bamboo shark in a 6x2 aqaurium, i havent seen as much as you've seen obviously but i do know what u mean....im sorry to hear about your caiman, thats to bad, i've lost 2 bamboo sharks and 2 stingrays due to illnesses (not to neglect or not proper housing dont worry)...do you still house crocodilians?